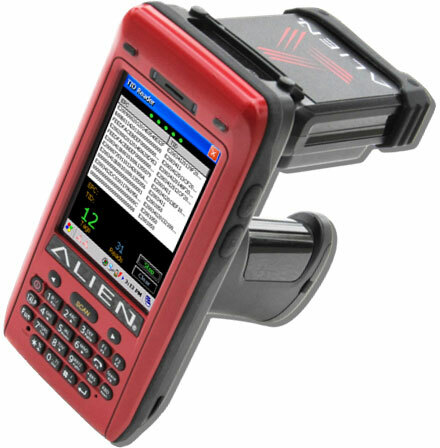 The Alien Technology ALH-900x family of handheld readers enables users to deploy manageable, robust, best-in class EPC Gen 2 RFID solutions for supply chain, manufacturing and asset management applications. 9001 Reader Kit. Includes ALH-9001 Reader and all accessories EU UHF RFID band: Cradle with Ethernet and USB, gun handle, sync cable, power adapter US & EU, stylus pen, hand strap, protective film. 9001 Reader Kit. Includes ALH-9001 Reader and all accessories US UHF RFID band: Cradle with Ethernet and USB, gun handle, sync cable, power adapter US & EU, stylus pen, hand strap, protective film. Not EMA. EU 9000 Reader Kit. Includes ALH-9000 Reader and all accessories EU UHF RFID band: Cradle with Ethernet and USB, gun handle, sync cable, power adapter US & EU, stylus pen, hand strap, protective film. 9000 Reader Kit. Includes ALH-9000 Reader and all accessories US UHF RFID band: Cradle with Ethernet and USB, gun handle, sync cable, power adapter US & EU, stylus pen, hand strap, protective film. Vehicle charger cable for ALH-900x Series. Leather case for the ALH-900x Series.